Odelein, who lives in Fox Chapel and is retired from the NHL, had been living the good life well: a steady diet of golf, travel and socializing. But while playing golf in Arizona in March, an encounter with the porcupine-like spike of a cactus set off a chain of events that would land him — like Sleeping Beauty pricked by a spindle — in a month-long coma, a rare and risky transplant procedure his only chance at survival. Odelein, 50, built a career in the NHL as a hard-hitting defenseman. Beloved in Montreal, where he won a Stanley Cup with the Canadiens in 1993, Odelein was known as much for his smile as for his fists, which were used so much on the ice that the arena came up with a personalized fight song for him. After leaving Montreal in 1996, he played for seven different teams, including Pittsburgh for his final season in 2005 to 2006. 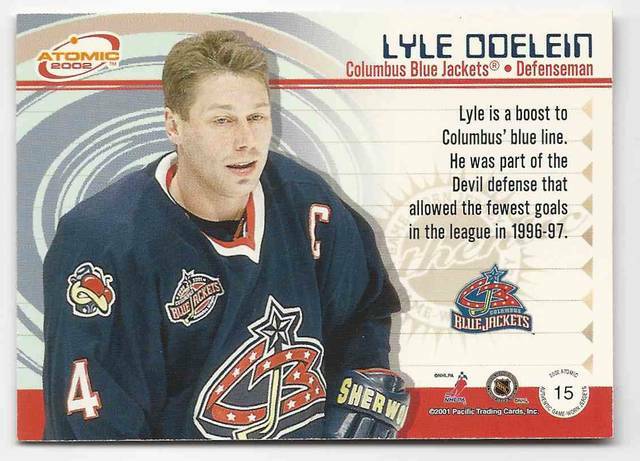 Editor’s Note: Odelein played for the Columbus Blue Jackets from 2000-02. He was picked in the expansion draft and was the team’s first captain. Although he grew up on a farm in Saskatchewan, he stayed in Pittsburgh after retirement. “I played in a lot of cities — it’s something about the people in Pittsburgh,” he said. “It’s been great.” One of those Pittsburgh people became his second wife, Laurel Odelein. The two own 54 SuperCuts hair salon franchises in Pittsburgh and beyond. In March of last year, Mr. Odelein was golfing with friends in Arizona when he ventured into the rough to retrieve a ball (“wasn’t mine by the way,” he laughed). He was, as he puts it, “attacked” by a jumping cactus — a spiky ball that detaches from its stalk at only the slightest touch. The cactus embedded itself into Mr. Odelein’s leg, through his pants. Impossible to pull out by hand because the spines are so sharp, Mr. Odelein and his friends used his golf club to pry it off of his leg. About a week later, Mr. Odelein was back home in Fox Chapel complaining of leg pain and flu-like symptoms. When he decided to stay home rather than fly to Pebble Beach in California for a golf trip, Ms. Odelein knew it was serious. In California for a business trip of her own, she asked a friend to check on him. Shocked by his condition, the friend took him to the hospital, calling their mutual friend, Allegheny General Hospital transplant surgeon Ngoc Thai, on the way to let them know they were coming. Mr. Odelein was intubated and placed in a medically induced coma. Doctors determined that the infection had attacked his aortic valve, which controls the blood pumped from the heart to the rest of the body. The infection damaged Mr. Odelein’s aortic valve so badly that half of the blood pumped out was coming back into the heart, rather than into his body. Mr. Odelein already had a mild underlying liver and kidney condition and the decreased blood flow stressed both organs, causing them to fail entirely. The only option for intervention was a simultaneous triple transplant of the aortic valve, heart and kidney, an extremely rare transplant that has been performed only a handful of times and never in Western Pennsylvania. It was risky enough for doctors to deliberate whether it was worth attempting at all — would those organs be better served going to a patient with a better chance of survival? While Mr. Odelein’s new aortic valve would come from a cow, he would need a liver and kidney from a person. The surgery was so unusual that a case study will be published in an upcoming issue of the Journal of Cardiothoracic and Vascular Anesthesia. Finally, they received news that a 49-year-old organ donor had died with a healthy kidney and liver. Mr. Odelein, who by this point had spent nearly a month in a coma, was taken into surgery. The plan was for Dr. Bailey and his team to first replace the aortic valve, and then for Dr. Thai’s team to step in for the liver transplant. With his chest left open, Mr. Odelein would then rest overnight, to allow the liver to resuscitate. The next morning, Dr. Thai would transplant the kidney. For hours, Ms. Odelein and many family members sat in the waiting room. She sat near a mirror that reflected a hallway, where she could see Dr. Thai walking even before he entered the room. Each time he came by — after the aortic valve transplant that took about five hours, after the liver transplant that took six hours, the next day after the kidney transplant that took eight more hours, it was to tell her that things had gone smoothly. A couple weeks after the operation, Mr. Odelein came out of his coma and while he couldn’t talk yet, he was winking at the nurses and showing signs of awareness. In early June, he was discharged from AGH into a rehab unit at West Penn Hospital. He began to build strength, slowly gaining back some of the 70 pounds he had lost during the ordeal. And in July, he got to go home, still unable to walk by himself. At their house, Ms. Odelein pointed to the office, which not long ago had a full hospital bed in it. Sitting on a couch in their living room, he and his wife recalled the nights when he would sit on that same couch and be unable to stand back up — on a couple of occasions, friends had to be called over to move him. And with Jefferson Starship’s “Nothing’s Gonna Stop Us Now” blaring over the Bell Centre arena’s loudspeaker, he did indeed stand and wave unassisted, to a huge ovation from fans. Now able to walk with ease, Mr. Odelein is still working on his balance and hopes to soon return to the golf course. He is also in the process of exchanging letters with the family of the organ donor, and plans to arrange a meeting. And he is extremely grateful — both to the donor and to the doctors who saved his life. Plenty of calls should be going to Los Angeles GM Rob Blake, who acknowledged the Kings are “at the bottom of the league.” They have a potential rental in forward Carl Hagelin and some older players with years left on their deals like Jeff Carter and Alec Martinez. It is a team in transition after winning the Cup in 2012 and 2014.